The work centers on a social exploration of motorcycle riding as a cognitive dream space akin to the “zone” or “flow” of artistic creation. If only it were that easy…Carmen Argote’s performance for the REDCAT-organized Pacific Standard Time Festival: Live Art LA/LA is an amateur motorcycle rally organized around an architectural mind map of the artist’s making. The work centers on a social exploration of motorcycle riding as a cognitive dream space akin to the “zone” or “flow” of artistic creation, inviting artists and culture workers who ride motorcycles themselves to collectively teach the artist about riding and about life. Argote will create the riding environment for the performance based on shapes created by the overlapping of floor plans from her childhood home in Pico-Union and her father’s house in Guadalajara. Collaborator-participants will choreograph movements on the course on their motorcycles, all the while telling story of their own experiences with cycling and domesticity. Collaborator-participants will also help her to develop the skills necessary to complete a cross-border journey from her father’s house back to Los Angeles, reversing a trip Argote’s father undertook nearly two decades ago, when he absconded with the vintage Moto Guzzi California V11 EV motorcycle that his daughter now intends to reclaim. 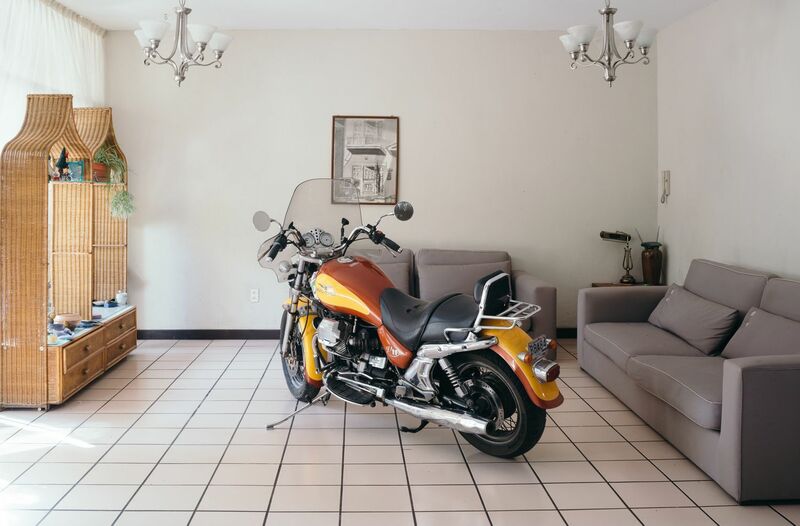 The motorcycle road trip, long associated with youthful masculinity and rebellion, and with transgression of both borders and social norms, offers a chance for Argote to realize her own great adventures across a transnational landscape. The performance will take place in Griffith Park’s Merry-Go-Round Lot 2 – see here for the map to the location. All audience members can park in Lot 1 or the lower Lot 2 – there will be ample parking available. Audience members should bring comfortable weather-appropriate clothes, water, sunblock, hats and sunglasses, as the entire 2-hour performance will be outside. Argote will follow the performance with a nine-week Artist Lab residency and installation at 18th Street Arts Center, which runs through March 23. The Opening Reception is February 24, 2018. Celebrating its 30th anniversary this year, 18th Street Arts Center is one of the top 20 artist residency programs in the US, and the largest in Southern California. Conceived as a radical think tank in the shape of an artist community, 18th Street supports artists from around the globe to imagine, research, and develop significant, meaningful new artworks and share them with the public. We strive to provide artists the space and time to take risks, to foster the ideal environment for artists and the public to directly engage, and to create experiences and partnerships that foster positive social change. Join us for one of our FREE upcoming events!